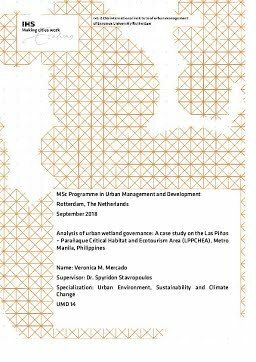 This research seeks to understand how institutional arrangement affect coordination of actors, in the context of urban wetland. This case study adopted the governance tool of Corsame (2016) regarding the coordination among actors. Understanding how institutional arrangement affects the level and nature of coordination are instrumental in identifying appropriate management strategies to address the problems in protected area management. The multifunctional nature and services of urban ecosystems, particularly wetlands, are vulnerable to threats associated with urbanization, climate change and land use change, and thus, calls for a sustainable management. The findings of this benefit the institutions through gathering necessary information and deepening of understanding on how to deal with the complexity of managing urban wetland within the environmental limits. Institutional arrangements are composed of institutions, with a set of rules—the legal framework and the roles and responsibilities of the actors. These factors establish the nature and level of coordination. Academic literature discussed the significance of urban wetlands, theories on coordination and network governance. The study area was on the Las Piñas – Parañaque Critical Habitat and Ecotourism Area (LPPCHEA) in Metro Manila, Philippines which is a known urban wetland protected area in the country. LPPCHEA is recognized for its biological features such as the last remaining mangrove frontier in Metro Manila. It includes important wetland habitats and is nationally and internationally recognized as a Critical Habitat in the country, and a Ramsar site. LPPCHEA is managed by a multi-institutional Management Council. Semi-structured interviews document review of relevant secondary data and observation was employed for the methodology of this study. Purposive and snowball sampling method was done, and the institutions were selected based on existing laws, regulations, and researched articles. Analysis disclosed that there are existing laws and regulations mainly supporting the conservation of LPPCHEA; actors are experts or highly knowledgeable of their roles and responsibilities within their mandate/ institution. Coordination gaps were observed due to unclear delineation of roles and responsibilities and undoocumented agreements---. Consequently, coordination among these actors resulted to Low to High ratings. This study confirms the study of Corsame (2016) wherein the quality of institutional arrangement influences how the actors coordinate with each other. Despite the presence of legal framework, coordination failed among actors. This is due to the unclear or loosely defined plan and undefined roles and responsibilities of the actors. Without a vision or direction articulated in the plans, without procedures and mechanisms, and clear roles and responsibilities defined for them, it has created a blind spot among the actors. Weak institutional arrangements created institutional complexity in the network. The tendency then of the actors is to function within their mandate and jurisdiction, and the conflicting mandates and priorities was never resolved—partition and component focus. Moreso, trust among institutions was found to have also influence coordination of actors in this study.